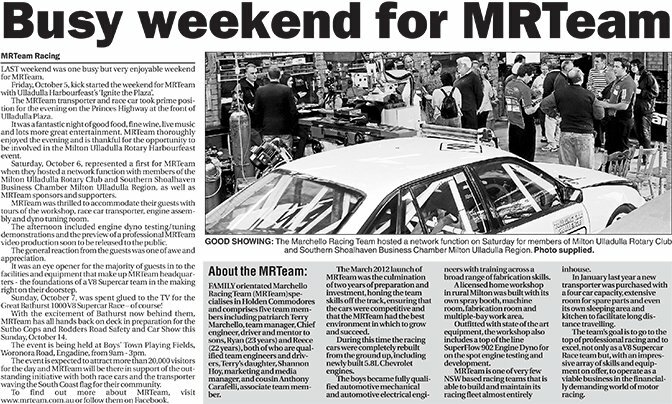 LAST weekend was one busy but very enjoyable weekend for MRTeam. Friday, October 5, kick started the weekend for MRTeam with Ulladulla Harbourfeast’s ‘Ignite the Plaza’. The MRTeam transporter and race car took prime position for the evening on the Princes Highway at the front of Ulladulla Plaza. It was a fantastic night of good food, fine wine, live music and lots more great entertainment. MRTeam thoroughly enjoyed the evening and is thankful for the opportunity to be involved in the Milton Ulladulla Rotary Harbourfeast event. Saturday, October 6, represented a first for MRTeam when they hosted a network function with members of the Milton Ulladulla Rotary Club and Southern Shoalhaven Business Chamber Milton Ulladulla Region, as well as MRTeam sponsors and supporters. MRTeam was thrilled to accommodate their guests with tours of the workshop, race car transporter, engine assembly and dyno tuning room. The afternoon included engine dyno testing/tuning demonstrations and the preview of a professional MRTeam video production soon to be released to the public. The general reaction from the guests was one of awe and appreciation. It was an eye opener for the majority of guests in to the facilities and equipment that make up MRTeam headquarters - the foundations of a V8 Supercar team in the making right on their doorstep. Sunday, October 7, was spent glued to the TV for the Great Bathurst 1000 V8 Supercar Race – of course! With the excitement of Bathurst now behind them, MRTeam has all hands back on deck in preparation for the Sutho Cops and Rodders Road Safety and Car Show this Sunday, October 14. The event is being held at Boys’ Town Playing Fields, Woronora Road, Engadine, from 9am - 3pm. The event is expected to attract more than 20,000 visitors for the day and MRTeam will be there in support of the outstanding initiative with both race cars and the transporter waving the South Coast flag for their community.